This nightgown pattern was created several years ago, when I was first bitten by the Bleuette bug. I'm posting the pattern here, but it may be a bit rough. It will fit both Reproduction and crocheted Bleuette. If you are not familiar with the Love Knot stitch, I recommend looking it up in a good crochet stitch dictionary, or Google it for instructions. I can do the stitch, but I'm not the best person to try to explain it! 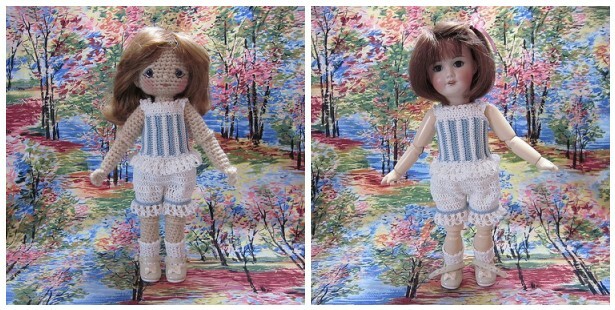 Here are a couple of very simple dresses you can make for your Bleuette or crochet Bleuette, using the basic camisole as the bodice. The drop waist dress has a crocheted skirt, and the short waist dress has a fabric skirt. Enjoy the day, and enjoy the crochet! 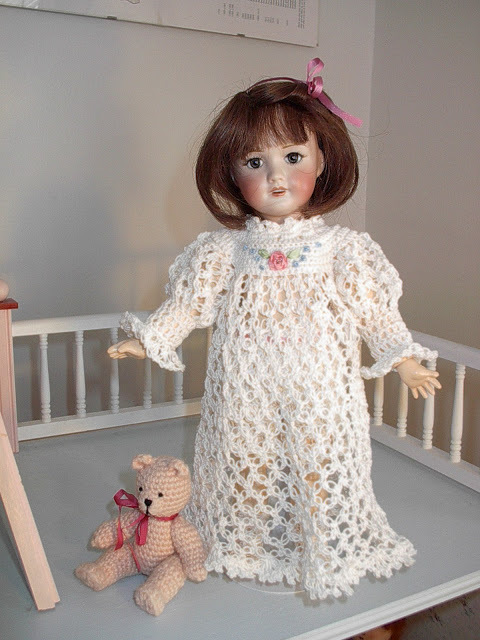 I love dolls in dainty undergarments. 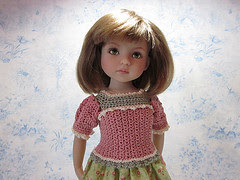 Undergarments are the first thing I make for a new doll. Not only does it get her decent quickly, but it also lets me figure out the basic garment construction; how many stitches around the waist, how long the bodice needs to be, how large to make the armhole openings. So now your Bleuette, or your crochet Bleuette, can have a camisole, pantaloons, and socks. The camisole pattern makes a lovely bodice for a sundress, a drop-waist dress or rompers, and the pantaloons can give you a good beginning for shorts or pants. She started life in 1905 as a give-away (thats right!) promotion to little French girls to subscribe to a girl's magazine...La Semaine De Suzette, which translates as 'Suzette's week.' The magazine's publishers were devout Catholics, and they were worried that the secularization of French public education would be detrimental to the development of young French womanhood. Thus the magazine, and its aim to help promote their (the publisher's) ideals of what a young Frenchwoman's accomplishments should be. One of these things was a proficiency with needlework and hand sewing, and Bleuette is the perfect little companion to sew for! La Semaine De Suzette published hundreds of patterns, from 1905 thru 1960, for their little Frenchwoman, Bleuette. There is a lot more to Bleuette's history, and her now incredible popularity. In 1905, 20,000 Bleuettes were initially produced by the French company SFBJ, but 60,000 subscriptions were received before the first issue was even published! Bleuette continued to be produced until 1960. 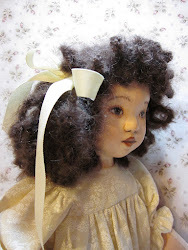 Now, many talented doll artist create reproduction Bleuettes. 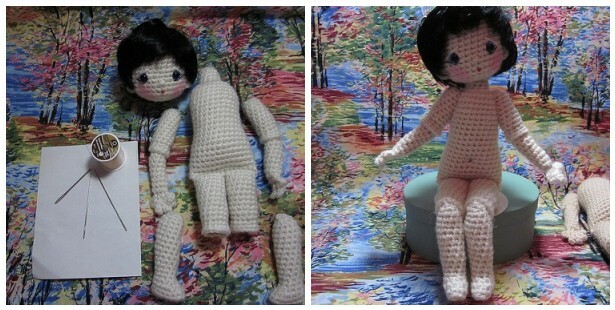 The doll in the middle of the picture above is one such reproduction, by Jackie Chimpky. 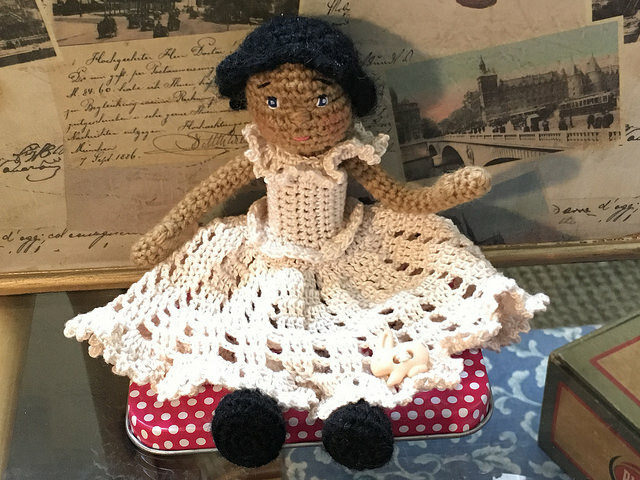 Here is the pattern to create you own Bleuette in the medium of crochet. 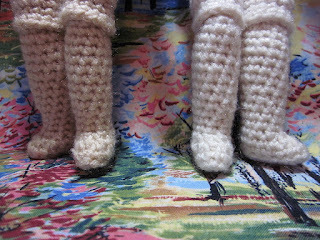 I used a size D crochet hook and both Vanna's Choice and Red Heart Super Saver to make these dolls ;the Super Saver worked up slightly larger (and was harder on my hands!) than the Vanna's Choice. This is a very tight gauge for worsted weight yarn; 5 single crochet to 1 inch; but it creates a very firm fabric for stuffing and jointing. Crochet Bleuette is 11 1/2 to 11 3/4 inches tall with her wig. She is jointed using strong craft thread; two strands doubled (so you are passing four strands through the body...you need this strength). 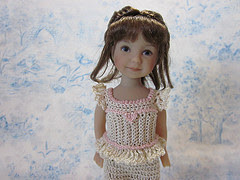 Other supplies you will need are a three inch dollmaking needle, 9mm acrylic eyes, and a plastic lid from a yogurt or cottage cheese carton to stiffen the bottom of her feet. 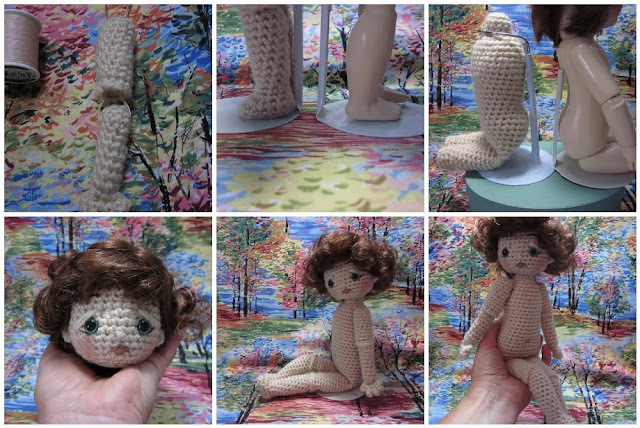 Bleuette Manikin This is a wonderful free pattern offered by Judi Ward. 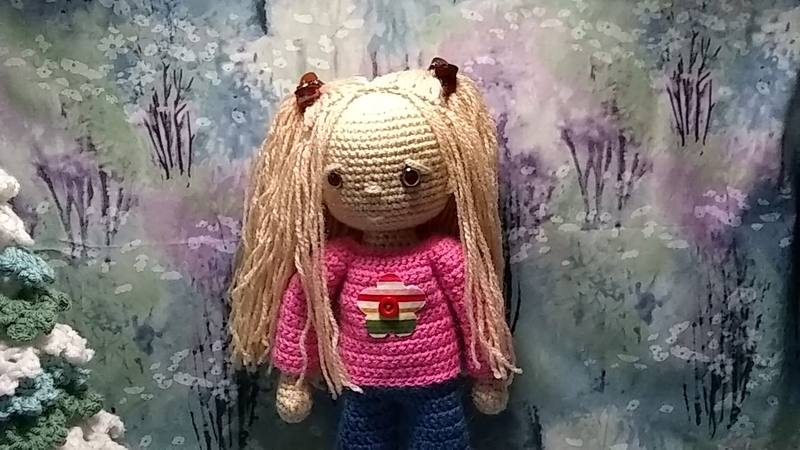 It is a simple manikin doll pattern with Bleuette's measurements, but it also makes a very charming, Bleuette size doll (without the joints). Bleuette in Cloth online class This is Judi Ward's online class for making a Bleuette in cloth, complete with joints! It is a great dollmaking class. Bleuette Sewing Club This is a yahoo group dedicated to sewing for Bleuette. 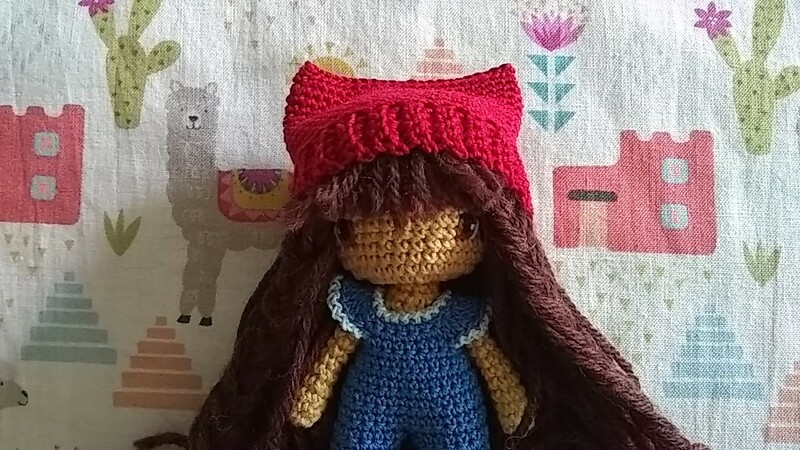 A new work in progress; Bleuette in crochet! Elbows and knees are jointed in a manner to imitate how Bleuette is jointed, and her head is jointed to move as well. I've had the idea for this doll in the back of my mind for some time. I'm fascinated with Bleuette, her history, her wardrobe, and her little-girl look. When I'm happy with the results, the pattern for her will be freely available here, just in time to celebrate the third birthday of this blog, and over 1000 followers! Leg joint technique is courtesy Dutzie, and she (the doll) also has a move-able head. You can find tutorials for both these techniques on the left sidebar of this blog, under "Tutorials by Joyce," and 'Tutorials." This is a great basic pattern to make as is, or to modify with your own special techniques. Enjoy the day, and enjoy the crochet!